To geologists it is no longer a hypothesis. It is now a theory. Every Earth scientist believes it is true. Right? And what is “it”? What I’m talking about is the theory of sea-floor-spreading and plate tectonics. As a result of a comprehensive review published late last year, sea floor spreading and its plate tectonics corollary are shown not to explain correctly the origin of our planet’s ocean basins and continents. And what if the current “theory” is incorrect? If it proves to be wrong, a huge barrier is removed to the acceptance of the Cayce readings’ story on the lost continents of Atlantis and Lemuria. No longer will it be delusional to consider vertical crustal movements to explain the origin of Earth’s ocean basins. “Elevator tectonics” will be in, and “shuffle-board” (plate) tectonics will be out, almost entirely. Although sea-floor spreading will still have a small place in geoscientists’ understanding of certain aspects of the origin and maintenance of continents and ocean basins, the really big picture, of elevation of ocean floors and - to a lesser degree - continents will rest upon a model that is driven by mantle surges. Geologists know, for example, that a global surge of Earth’s mantle began in Mesozoic time. At its peak in the Cretaceous period, ocean floors in the Atlantic and Pacific were elevated above sea level. The resulting oceanic continents were full of volcanic terraces. The Mesozoic mantle-surge event was then followed by gradual cooling and collapse of the oceanic volcanic edifices. To understand this radical departure in our understanding of mantle convective behavior, and its effects on Earth’s crustal structures, we need to review briefly the current model of sea-floor spreading and plate tectonics. Fig 1. The conventional model of sea-floor spreading. 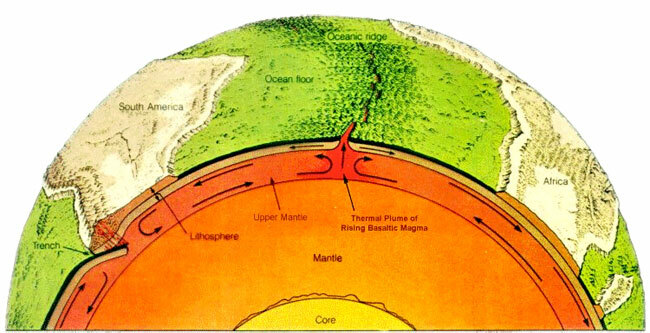 As shown in Figure 1, geologists currently believe that thermal plumes of hot magma are semi-continuously moving upward beneath ridges found in all of the world’s oceans. This semi-fluid basalt rock is exuded here and there along a ridge crest. The process forces sea-floor crustal plates on either side away from the ocean ridge and toward the continents. The continents may either be carried along by the adjacent sea floor, or the spreading sea floor may under-thrust a relatively immovable continent. See Figure 1 for examples of both hypothetical situations. A given pulse of magma, over a relatively short distance along an ocean ridge, becomes magnetized when the semi-molten material cools below a specific temperature. Iron minerals in the basalt magma are then frozen in the rock and they point in the direction of the prevailing magnetic field. Geophysical survey methods can then used to detect whether the sea-floor rocks were magnetized in a normal geomagnetic field (like today’s) or in a reversed field. Because Earth’s magnetic field is moving and/or reversing through time, magnetic orientation directions of basalt exudations allow the sea-floor rock slabs be correlated with one another. This process results in a sort of “tape-recording” of the formation and movement of rock masses of the spreading sea floor - or so the hypothesis goes. The crystallized rock of each new exudation then splits in two along an axis coinciding with the central valley of the ocean ridge. In Figure 2, two brown-colored slabs of newly crystallized, ocean-floor basalt are separated by a black line representing the central valley of a mid-ocean ridge. Fig. 2. Magnetic stripes and the current sea floor spreading model. Sea-floor stripes are formed by ocean-floor magma that cooled and crystallized in a specific magnetic-field orientation. These rock masses may be offset later along transform faults or large-scale fractures that run perpendicular to the ocean ridge. The presence of magnetic stripes on the ocean floor has been thought to be prima facie evidence for sea-floor spreading, and the basis for the plate tectonics (PT) model of crustal motion. Note in the diagram that segments of magnetic stripes of the same age are confined on either end by transform faults that run perpendicular to the ocean ridge. It was assumed early-on in the development of the PT theory that striped segments of the same age were offset from one another due to different amounts of subsequent effusions of magma at the ridge crest. Larger effusions would push the plates farther apart than would smaller ones. Here then, is an abbreviated description of the sea-floor-spreading and plate tectonics model for the dynamic behavior of the crust and underlying mantle. Most geologists have assumed this model correct for the last 25 years or so. Its acceptance by geoscientists has, quite naturally, caused great difficulty for those who want to accept the Cayce readings’ story of Atlantis and Lemuria. How could there ever have been continents in the Atlantic or the Pacific oceans where there are now ocean floors? For doesn’t all the evidence point to stability of the submerged ocean floors and to the basically horizontal movement of crustal plates the world over? Now comes a convincing treatise on what may really be happening in the realm of global crust and upper-mantle dynamics. I will be basing the rest of this article on MacKenzie Keith’s comprehensive examination of sea floor spreading and plate tectonics, published last fall.1 His paper has about 300 references and is the product of Keith’s life of research and teaching in the field, laboratory, and classroom. Upon his death last year he was Emeritus Professor of Geochemistry at Pennsylvania State University. Dr. Keith begins modestly by saying that although the essential features of the PT hypothesis are widely accepted, some aspects of the model are open to question. Quite simply, they conflict with known properties of Earth’s materials and the global crust/mantle dynamic system. Keith’s first objection is to the hypothesis that the plates are internally rigid. If a stress is applied to one side, it is transmitted to the opposite side with no deformation of the plate interior. But this is inconsistent with the results of experiments on rock strength and with the factors that govern the strength of large masses of rock over geologic time. Actually, large rock masses are weak, and they deform under the influence of heat. Keith next states that there is a need to re-examine the hypothesis of upwelling of magma beneath the axis of an ocean ridge. Computer models of heat flow beneath ocean ridges are based upon evidence of a wide plume of ascending molten basalt to produce the magma effusions along the ridge. But how, asks Keith, can broad plumes generate the narrow zone of axial ridge volcanism, the “knife-edge” separation of adjacent flow regimes on either side of a transform fault (see Fig. 2), and the unbelievable “overlapping spreading centers” advocated by some geologists? Further questions are related to the concept of ocean floor spreading and the tape-recorder model for generating the oceanic magnetic stripes. Different rock chemical compositions are often found on opposite flanks of the ocean ridges. The rocks should be of the same composition if they come from the same magma effusion. And what of the failure to find the required narrow zone of crustal accretion, with the property of dividing neatly so that matching halves move to either side? Keith now moves ahead with certainty to answer these questions. He asserts that no spreading is required to account for the observed sea-floor features. Instead, the oceanic magnetic stripes can be explained by narrowing of a formerly very wide mid-ocean volcanic zone and by consequent crestward migration of something he calls the “blocking temperature,” discussed below. He hypothesizes that a Mesozoic surge of mantle flow and volcanic-zone expansion that peaked in Cretaceous time (between 66 and 144 million years ago) produced a different “volcanic face” on Earth. Elevated ocean floors then began to collapse over millions of years, leading to the features we find today. We’ll begin by considering what happens relative to the mid-Atlantic ridge (MAR) of the Atlantic Ocean in the vicinity of the now submerged Reykjanes Ridge south of Iceland. Instead of hot, plastic upper mantle material having flowed away from the mid-ocean ridge, as shown in Figure 1, it has flowed toward it and elevated the entire ocean floor, as shown in Figure 3.
part of the MAR running southwest of Iceland (Fig. 4). This figure is modified from Keith, 2001, Fig. 11.
following a Cretaceous-age peak in volcanic activity. represent conditions at magnetic anomaly ages 36, 24, and 16 million years ago (Ma). either normal or reverse remnant magnetism and thus record the Earth’s geomagnetic field orientation. I have taken the liberty on Figure 3 of labeling the emerged part of the Reykjanes Ridge “Atlantis.” There is truly no better name to use for this formerly elevated, now- submerged oceanic continent. For actual physical evidence that parts of the mid-Atlantic ridge were above water during recent time, see below. To continue now to elucidate Keith’s explanation of the origin of the magnetic stripes on the ocean floor, we quote from his p. 268, as follows. Magnetic Banding According to Keith’s Cooling Model. Figure 4 may help to explain the above quote, as it applies specifically to magnetic banding. The basic idea is that a narrowing of the zone of mid-ocean ridge basalt volcanism (Fig. 4, reddish portions of bars) will be accompanied by crestward migration of the blocking temperature isotherm (Fig. 3). This is the temperature at which the magnetic minerals acquire remnant magnetism and thus record reversals of Earth’s magnetic field. Fig. 4. Idealized snapshots of one side of a mid-ocean ridge, to show the development of oceanic magnetic stripes, from the mid-Cretaceous period of Mesozoic time to the Present, as a result of gradual narrowing of the active mid-ocean volcanic zone. A is the ridge axis. This diagram, modified from Keith, Fig. 10, shows migration of the blocking temperature isotherm B. The reddish color to the right of B indicates the portion of the ridge for which the principal magnetic source remains above the blocking temperature. Translating Keith’s words for the non-geologist reader, imagine that the primary, heat-driven flow of the uppermost mantle is outward from beneath a continent like Africa, and toward the MAR. As the mantle moves there is subsequent heat loss in the oceanic region. In the downstream region of lateral flow and heat loss there is development of an upper mantle boundary layer that eventually becomes unstable and yields a regular pattern of upper mantle “rolls” aligned in the direction of principal flow. Boundaries that develop along each edge of a roll result in ocean floor fractures and transform faults. (A transform fault is merely a near-vertical surface over which one side slips past the other, but is unique in that the displacement suddenly stops or changes form). To end his description of the formation of magnetic stripes on the sea-floor, Keith cites relevant laboratory, numerical modeling, and field measurements. He concludes by saying that the evidence is consistent with his proposed upper-mantle convergent flow and contrary to the plate tectonics model of mid-ocean upwelling and divergent flow. What will a cross-section diagram of a mid-ocean ridge structure look like for Keith’s crustal-collapse-under-cooling model? Figure 5 gives us the picture. as adapted from Fig. 4 of his paper. The thickness of the crust is greatly exaggerated to show the structure. This is a “flex load” syncline of former wide extent that reflects a crestward increase in volcanic loading and subsidence. Red represents the region between the mantle and the sub-axial wedge of subducted crust, and is a zone of melting. Blue lines represent crustal layering, dipping toward the axial valley. Solid lines are non-specific isotherms (lines of equal temperature). Green represents the low-velocity zone (for seismic wave propagation) that characterizes crust and mantle mixing. “M” denotes the “Moho,” a boundary that separates the Earth’s crust from the underlying mantle. Incidental, almost, to Keith’s efforts to buttress one of his points about a former emergent continent in the Atlantic ocean is the material that he summarizes on former shallow water or emergent sites sampled by the Deep Sea Drilling Project (DSDP). The sampling sites are currently underwater in the region of the Mid-Atlantic Ridge (MAR). Locations for three of these sites (Keith, 2001, Table 1) are shown by large red dots on Figure 6, in a relief map of the Azores. The red dots are rather large because, while the sampling coordinates that are listed give degrees north latitude, they do not give degrees west longitude. It is understood, however, that the samples were taken in the vicinity of the MAR axial valley, clearly visible on Figure 6. All of the above findings are strong indicators of a formerly emerged MAR. And they suggest that this volcanic terrain has sunk a minimum of 12,300 ft since being exposed to the atmosphere. Note that Keith’s Table 1 lists six additional MAR sampling sites - to the south of those plotted on our Figure 6 and on down to the equator. Two of these sampling sites show ridge tops flattened by wave erosion, one revealed Tertiary-age shallow water sediment, and another revealed Cretaceous-age shallow water sediment. A final, rather startling finding consists of canyons and a trellis drainage system, quite possibly formed subaerially at a depth greater than 9800 ft. The MAR location is between 26º and 27ºN. Fig. 6. Physiographic diagram of the Azores region, based on a diagram by B. Heezen and M. Tharp. See text for an explanation of red dots A-C, sites of deep-water sampling of subaerial material representative of an emergent continent. (Subaerial refers to conditions and processes that exist or operate in the open air on and immediately adjacent to a land surface). A repository for the records of the Atlantean civilization may be found in the area shown by blue shading. The Atlantean records repository will be found in a specific temple "where a portion of the temples may yet be discovered." To illustrate the above process in map view, we have modified Keith’s Figure 9 and turned it into our Figure 7.
the proposed mechanism for generating oceanic magnetic stripes. The narrowing color pattern shows the extent of active volcanism at each selected stage of ridge sinking and cooling. thus recording the inclination and reversals of the Earth’s magnetic field. Approximate magnetic anomaly ages in the upper right of each panel are from Kent and Gradstein (1986). See caption for Fig. 4, for complete citation. Ma = millions of years before the present. Figure 7 shows four map views of a northern portion of the narrowing active volcanic zone of the slowly cooling, contracting, and sinking oceanic continent called here “Atlantis.” The two outermost bands of the 78 Ma panel are not seen in panel Ma 55. This is because, over the 23 million years between 78 Ma and 55 Ma, the trailing edges of the crestward cooling mantle and crust have fallen below the blocking temperature. These trailing edges have moved progressively to become the outer edges of the volcanic zone at 55 Ma. In the process, the formerly plastic rocks of the outermost bands of Figure 7, panel 78 Ma, have crystallized and locked-in the magnetic orientations of their contained ferromagnetic minerals. This gives rise to the type of ocean-floor stripes shown in Figure 2. To appreciate this process in vertical cross-section view, refer to Figure 3. Here one finds four snapshots through time of a cross-section of the western half of the continent. Panel 38 Ma on Figure 3 corresponds roughly to panel 35 Ma on Figure 7. The movement of the blocking temperature isotherm B on Figure 3 relates roughly to the trailing edge of the western red band on panel M 35 of Fig. 7. Note that the highly schematized representations of the changes in the continent in Figures 3 and 7 cannot capture all natural variations in land-sea relationships. Thus, panels 16 Ma and 2 Ma in Figure 3 show a completely submerged surface of “Atlantis,” and the MAR has narrowed greatly to a narrow band in panel Ma 8 of Fig. 7. The response of rock masses to the contracting oceanic crust and uppermost mantle is not quite that straightforward, however. One can assume that local elevations of the sea floor to above-sea-level positions would have survived generalized continental sinking in some places, remaining there much longer than indicated by the diagrams. Thus, the Poseidonis of Zhirov’s research (Fig. 6) and the Poseidia of the Cayce readings could well have existed above sea level until as late as about 12,000 years ago. This article would be too long if I were to go into any more of the aspects of the professor’s marvelous analytical piece of work. The evidence for emergence of Lemuria will be dealt with in a separate article. Keith’s application of the results of his literature review to continental rifts and their associations with oceanic rifts, to oceanic island-chain dynamics in the Pacific, and to a number of other important topics like hotspots must also be deferred. Suffice it to say that Keith believed that the essence of his proposed global model “is that oceanic crust is a principal reservoir and that selective recycling of its components is a counter to weathering and riverine [sediment] transport from continent to ocean, and a key process in the self-regulating Earth system” (p. 282). He has little to say about the forces that drove the Mesozoic mantle surge, other than to say that there is a strong possibility that it may have been triggered by a cluster of meteorite impacts in the western equatorial Pacific. These impacts may have reactivated lower mantle, during a surge-promoted change from layered to whole-mantle convection. Deep “roll-margin” mantle recycling associated with the proposed impact-triggered change from layered to whole-mantle convection, and resultant mantle surge is deduced to have formed a range of mixtures that apparently constituted a source of Cretaceous basaltic magma and oceanic crust. Three reading fragments describe the extent of Atlantis, beginning around 10 million years ago and then down through time to the days of Amilius, which “time” may have begun some 200,000 years ago. Describe the earth’s surface at the period of the appearance of the five projections. A This has been given. In the first, or that known as the beginning, or in the Caucasian and Carpathian, or the Garden of Eden, in that land which lies now much in the desert, yet much in mountain and much in the rolling lands there. The extreme northern portions were then the southern portions, or the polar regions were then turned to where they occupied more of the tropical and semi-tropical regions; hence it would be hard to discern or disseminate the change. The Nile entered into the Atlantic Ocean. What is now the Sahara was an inhabited land and very fertile. What is now the central portion of this country, or the Mississippi basin, was then all in the ocean; only the plateau was existent, or the regions that are now portions of Nevada, Utah and Arizona formed the greater part of what we know as the United States. That along the Atlantic board formed the outer portion then, or the lowlands of Atlantis. The Andean, or the Pacific coast of South America, occupied then the extreme western portion of Lemuria. The Urals and the northern regions of same were turned into a tropical land. The desert in the Mongolian land was then the fertile portion. This may enable you to form SOME concept of the status of the earth’s representations at that time! The oceans were then turned about; they no longer bear their names, yet from whence obtained they their names? What is the legend, even, as to their names? The position as the continent of Atlantis occupied, is that as between the Gulf of Mexico on the one hand - and the Mediterranean upon the other. Evidences of this lost civilization are to be found in the Pyrenees and Morocco on the one hand, British Honduras, Yucatan and America upon the other. There are some protruding portions within this that must have at one time or another been a portion of this great continent. The British West Indies or the Bahamas, and a portion of same that may be seen in the present - if the geological survey would be made in some of these especially, or notably, in Bimini and in the Gulf Stream through this vicinity, these may be even yet determined. Q: How large was Atlantis during the time of Amilius? [Perhaps beginning roughly 200,000 years ago]. A: Comparison, that of Europe including Asia in Europe - not Asia, but Asia in Europe - see? This composed, as seen, in or after the first of the destructions, that which would be termed now - with the present position - the southernmost portion of same - islands as created by those of the first (as man would call) volcanic or eruptive forces brought into play in the destruction of same. Q: Was Atlantis one large continent, or a group of large islands? A: Would it not be well to read just that given? Why confuse in the questionings? As has been given, what would be considered one large continent, until the first eruptions brought those changes - from what would now, with the present position of the earth in its rotation, or movements about its sun, through space, about Arcturus, about the Pleiades, that of a whole or one continent. Then with the breaking up, producing more of the nature of large islands, with the intervening canals or ravines, gulfs, bays or streams, as came from the various ELEMENTAL forces that were set in motion by this CHARGING - as it were - OF the forces that were collected as the basis for those elements that would produce destructive forces, as might be placed in various quarters or gathering places of those beasts, or the periods when the larger animals roved the earth - WITH that period of man’s indwelling. Another reading describes the approaching emergence of part of Atlantis. This could result from a several-degree (10º or so?) pole shift, and /or the beginning of a new mantle surge. It would be well if this entity were to seek either of the three phases of the ways and means in which these records of the activities of individuals were preserved - the one in the Atlantean land, that sank, which will rise and is rising again…. Refer to Figure 6 for our inferred location of the temple of records preserved in the Atlantean land. Now if a new mantle surge is to begin - and it would begin very slowly from our time perspective - then the following reading might be relevant. The “fire” in this reading fragment would refer to the volcanic activity associated with a new mantle surge. Extensive worldwide volcanism might include huge exudations of flood basalts on land, reminiscent of the Deccan traps in India, the flood basalts of the Pacific Northwest, and the Siberian traps. Will this entity see such again (the Deluge) occur in the Earth? Will it be among those who may be given those directions as to how, where, the elect may be preserved for the replenishing again of the Earth? Remember, not by water - for it is the mother of life in the Earth - but rather by the elements, fire. Three more readings relate clearly to the part of Keith’s model that deals with the cooling, narrowing, and collapse of the edifice we call Atlantis. One of the events cited, however, has a human origin. This was the man-made eruption that caused a part of the, by then, narrowed volcanic ridge (the MAR) to go “into the depths,” some 19,400 years ago. Table 1 provides a summary of all of the geophysically related dates that I could find for the demise of Atlantis. 19,400 Man-induced eruption causes the portion of Atlantis near the Sargasso Sea to go "into the depths." Volcano-like upheaval separates Atlantis into five islands and induces a pole shift (author’s interpretation) causing ice sheets to melt in Europe, Asia, and North America. 364-11, 364-4, 877-26, 440-5, 1291-1 (?) 488-5? Beginning and ending dates of the Younger Dryas climatic event during the middle of the ongoing deglaciation of the North Atlantic region. This 1,300±70-year period marked a return to glacial-like climatic conditions. It terminated abruptly with a 7ºC rise in temperature over a few years’ time. Note that the final destruction of Atlantis and the construction of the Great Pyramid occurred during this Younger Drays period. In addition, several readings provide undated references to “the period of the second destruction.” These are readings 5096-1, 2344-1, 3022-1, 2987-1, 2390-1, 2157-1, 1610-1, and 268-3. I do not think that this period is the same as the period of the “second of the eruptions.” The second destruction is probably the one at 19,400 B.P., but this needs further research. The third, or final destruction is said to have been “nearly ten thousand years before the Prince of Peace came.” (288-1) This makes the final destruction roughly 11,900 B.P., assuming that “nearly” equates to roughly 100 years. It’s difficult to know how well the readings’ story of Atlantis compares to Keith’s model of an emergent MAR called Atlantis and its final destruction after about 78 million years of existence. Figure 7, for example, shows (bottom panel) that 78 million years ago (“78 Ma”) Atlantis could have conformed reasonably well to the description of it given in readings 364-3 and 364-13. But a very narrow linear strip of the MAR, perhaps bulging outward as the strip trended toward Iceland, would have to satisfy as Atlantis, per reading 364-6. It is impossible to say much more on this subject in view of the lack of more definitive information from the readings. Important information missing from the readings would provide data on the extent and shape of Atlantis at various moments in time. And each of those moments would need to be related to the various phases of the history of the Atlantean civilization. All of these things will become much clearer once the records of the history of Atlantis are recovered from the three repositories for such information mentioned in the readings. The locations of these records - according to the readings and to our interpretations of them - can be found in, "Locations of The Records of The Atlantean Civilization and its Firestone"